Delicate pink colour with slight blue hints & lively stream of fine bubbles. The pure, precise bouquet mingles sweet honeysuckle and lily with bright red fruit and mandarin zest, combined with typical Louis Roederer smokiness and ripeness. Precision and purity are echoed on the palate with a crunchy, mature attack of Pinot Noir, accompanied by freshness from the Chardonnay. After aeration, flavours of ripe, juicy fruit blend in a texture that is both smooth and fresh. Finesse and elegance with a long finish. It is a fantastic pairing with fish such as salmon; meat including lamb, veal, guinea fowl, and even pheasant; and also soft cheeses such as Chaource and Brillat-Savarin. It can also be served with red fruit based deserts that are less sweet, such as a red fruit zabaglione or a red fruit gratin. Vinified in oak tuns without malolactic fermentation. The Rosé 2010 cuvée is aged for four years on lees and is left for a minimum period of six months after disgorging to attain optimum maturity. A great Rosé champagne must be made from very ripe grapes - sometimes difficult to obtain in the Champagne climate. As a result, Louis Roederer has chosen to invest in one of the earliest Champagne crus villages, Cumières, for which the steeply-sloping, shallow clay and limestone soils face south and benefit from additional light reflected from the river Marne, enabling great phenolic maturity to be achieved. In these select terroirs, Louis Roederer applies the precision wine-making methods required to craft a saignée rosé. The Chardonnay is from the north facing slopes in Chouilly, bringing bright and fresh notes. The 2010 vintage experienced a particularly frosty winter with a late bud-break between 19th-22nd April. Spring and early summer were cool and dry with vines flowering between 16th-19th June. After a very dry July, August brought the much-desired rain to trigger ripening. Harvest began on 13th September. A great Rosé champagne must be made from very ripe grapes - sometimes difficult to obtain in the Champagne climate. As a result, Louis Roederer has chosen to invest in one of the earliest Champagne crus, Cumières, for which the steeply-sloping, shallow clay and limestone soils face south and benefit from additional light reflected from the river Marne, enabling great phenolic maturity to be achieved. 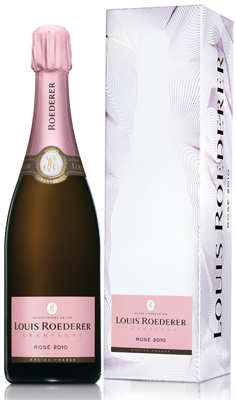 In these select terroirs, Louis Roederer applies the precision wine-making methods required to craft a saignée rosé.